Seen at the intersection of Braid and Brunette in New Westminster, near the Coquitlam border. 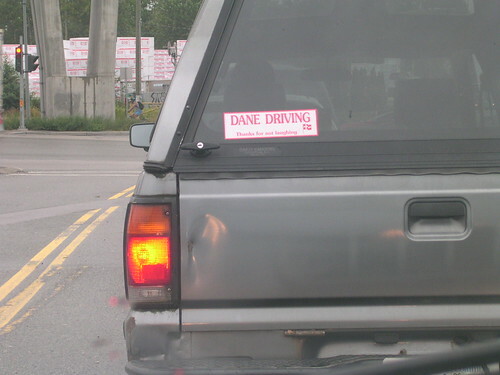 At first I suspected it was Vancouver blogger Dane. Then I saw the Danish flag. So, um, are the Danish supposed to be bad drivers? Maybe our Vancouver Great Dane blogger, Mr. Jan Karlsberg can answer that. PS Check out his post on our lame Vancouver attempts at prank billboard modifications.